Media reports regarding the American crude oil industry have been uniformly positive in the past few months. Oil prices have dropped to their lowest level since 2010 and along with it prices at the pump. According to some reports, the US now produces as much or more oil than either Saudi Arabia or Russia. As the US closes in on energy independence, our reliance on foreign suppliers dwindles. Some suggest we are nearing a time of oil and economic security not seen in decades. If only that were true. The above rendering of events is taken, almost without examination, as gospel truth in the United States. The only subject of debate seems to be ascertaining whether hydraulic fracturing ("fracking") is safe for the environment of if burning the additional hydrocarbons is adding to risks of climate change. We find this near-religious belief in looming US oil "independence" to be troubling, as a considerable body of publicly available information leads to a very different conclusion. Many TV commentators and opinion leaders highlight the fact US domestic oil production has just eclipsed the Saudi Arabian and Russian behemoths. What the sound bites fail to provide, however, is context. According to the US Energy Information Administration (EIA), the current daily production of crude oil and other liquids, Saudi Arabia produce 11.7 million barrels of oil per day (mbd), Russia 10.4 mbd, and the US at 11.1 mbd. But the gross amount of oil each nation produces isn't what matters. It's net oil. The EIA also reports that Saudi Arabia consumes 2.9 mbd, leaving and estimated 8.6 mbd available for export. Russia consumes 3.3 mbd, leaving 7.2 mbd available for export. The US consumes, however, 18.9 mbd per day, leaving a deficit of 6.6 mbd that has to be met by importing foreign oil. Russia and Saudi Arabia, therefore, remain securely in the global petroleum driver's seat while the US remains the globe's most vulnerable. Unfortunately, that's not the only red warning flag. - high-quality plays are not ubiquitous - nearly two-thirds of U.S. tight oil production comes from just two plays - the Bakken and Eagle Ford - and most production comes from relatively small "sweet spots" within these plays. - production declines of wells are 80%-85% in the first 3 years meaning that 40%-45% of production must be replaced each year by more drilling to keep production flat. - as sweet spots become saturated with wells, drilling must move into lower quality parts of these plays (which have the bulk of remaining drilling locations and average well production of half or less that of sweet spots), hastening the production falloff after peak. - other plays have not been found that compare to the Bakken and Eagle Ford. Plays such as the Permian Basin, Niobrara and Austin Chalk represent redevelopments of existing plays with new fracking technology. We find the assessment by the US Department of Energy (DOE) that these plays will produce four to five times their historical production by 2040 to be optimistic in the extreme. Other emerging plays will produce additional tight oil but likely nothing comparable in scale to the Bakken or Eagle Ford. - DOE forecasts a peak in U.S. tight oil in 2021 in its reference case, followed by a gradual decline. But to meet even this forecast twice as much oil will have to be produced from other plays as is projected from the Bakken and Eagle Ford by 2040, which evidence suggests is unlikely to be realized. Yet geological and technological factors aren't the only issues that pose constraints to future LTO production. There is a growing capital-expenditure (capex) crisis in the upstream oil industry that raises serious concerns about not merely US production, but future global oil supplies. 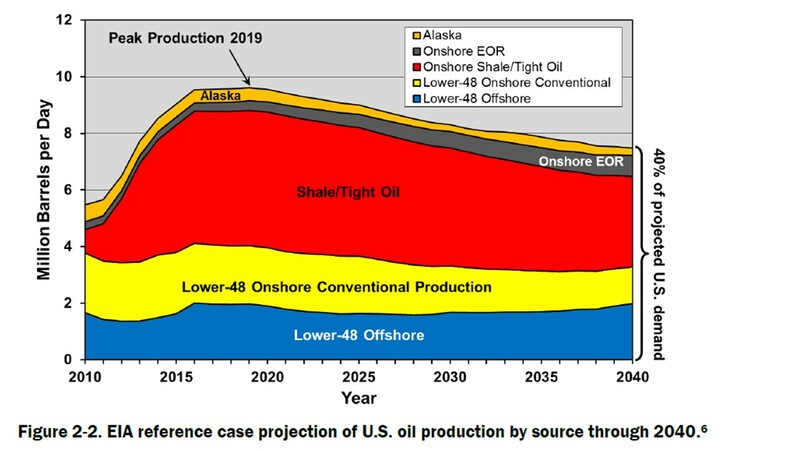 The upstream oil industry's capital intensity has increased astronomically over the last decade owing to the massive annual investments now required in order to 1) replace declining output in ageing conventional fields, 2) counter the high decline rates in US shale-oil as explained above, and 3) produce ever increasing amounts of oil over and above replacement levels so as to meet growing global demand. Capex data from the International Energy Data (IEA) published in last year's World Energy Outlook (WEO) and production data from the US Energy Information Administration show that from 2005 to 2013 global upstream capex increased by 100% (from $220bn to $440bn), but that over the same period the global oil supply increased by only 6% (5.4mbd). Moreover, the rising costs associated with the industry's increasing capital intensity have run ahead of prices since 2011, and led to a fall in the oil majors' capital productivity and hence to cuts in their capex budgets since the beginning of this year. And yet despite these cutbacks, the IEA's World Energy Investment Outlook 2014 (WEO) published in June raised its estimate of required future upstream capex to meet global oil demand over the next two decades by $2 trillion. In short, we think that US shale-oil production is likely to peak in 2017-18, and that the capex crisis of the oil majors is placing at risk its ability to meet future demand. It is imperative, then, that American policy makers and people recognize that the fracking-enabled spike in US crude oil production most likely represents only a temporary reprieve from the declining production levels experienced from 1970 to 2005. Heading into Thanksgiving weekend gasoline prices are expected to be at their lowest mark since 2009. The medium and long term indicators, as we've noted, indicate this drop will be a short reprieve before prices at the pump rise in tandem with increases in oil price. In the latest report from the United Nations' Intergovernmental Panel on Climate Change (IPCC), risks from the threat of climate change are growing. The report concluded that, "Continued emission of greenhouse gases will cause further warming and long-lasting changes in all components of the climate system, increasing the likelihood of severe, pervasive and irreversible impacts for people and ecosystems." According to the New York Times, the US Administration is taking the matter seriously. "(T)he president's science adviser, John P. Holdren, calling [the IPCC report] 'yet another wake-up call to the global community that we must act together swiftly and aggressively in order to stem climate change and avoid its worst impacts." Success with this kind of investment is not certain, and it will certainly entail failure, but we believe it unwise to continue following the status quo, without exploring innovative means of powering the economy. In the face of mounting evidence the energy inputs necessary to power our economic system cannot be long sustained. Further, if our analysis is correct and the US makes no policy changes, the United States will soon begin steady decline in relative power to Russia and Saudi Arabia, as America's dependence on foreign oil climbs. The time to mitigate or avoid that future outcome is to recognize the warning signs now and take prudent action. The views presented in this article are those of the authors alone and do not represent the opinions of the Department of Defense or US Army.